Ordinary number signatures Wiwatchai-Leng UNC about 31,000 - 36,000 baht. Ordinary number signatures Wiwatchai-Leng EF about³ 12,000 - 12,500 baht. Ordinary number signatures Wiwatchai-Leng VF about 9,500 - 10,000 baht. Ordinary number signatures Tonawanik-Wiwatchai UNC about 85,000 - 89,000 baht. Ordinary number signatures Tonawanik-Wiwatchai VF about 35,000 - 38,000 baht. Ordinary number signatures Tonawanik-Wiwatchai F about 12,000 - 13,000 baht. Ordinary number signatures Wiwatchai-Dej EF about 35,000 - 37,000 baht. Ordinary number signatures Wiwatchai-Dej F about 12,000 - 13,000 baht. Ordinary number signatures Plaek-Dej VF about 55,000 - 58,000 baht. 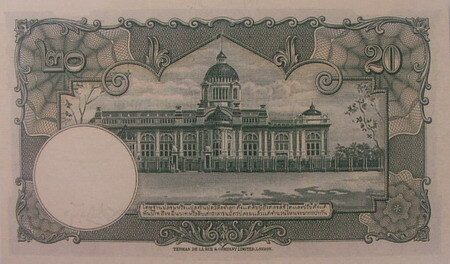 The 9th series 20 baht type 1 banknote is identical to the 4th series banknote (Thomas de la Rue). But the main object is the King Rama 9. Even though each type of 20 baht 9th series banknote is quite similar, the different points of the 20 baht type 1 banknote are the portrait of King Rama 9 in younger of age and the serial number is printed in red color. 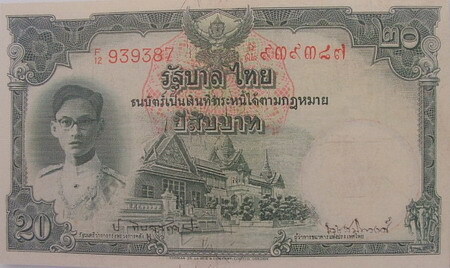 The 20 baht type 1 banknotes were announced on 24th May 1948. The main object is the image of King Rama 9 in the Chakri uniform. Embedded in the middle strip of the note with red and blue silk fibers. The middle image is Dusidapirom pavilion and Chakri Maha Prasart throne hall. The serial number is printed in red color.